Here’s another exciting snack from the Marks & Spencer's 'Guilt Free Snacking' range. 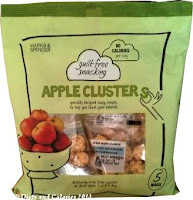 M&S Apple Clusters are deliciously crispy little clusters of dried apple. They’re sold in multipacks containing 5 individual bags each worth 80 calories. 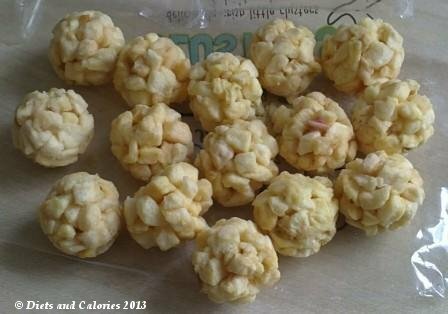 Inside each bag you’ll find 15 (sometimes 16 if you’re lucky) little apple clusters which have just 5 calories each. These Apple Clusters are a bit different. Not only do they look unique, they’re healthy too. The main ingredient is dried apple which makes up 95% of the snack and they're a delight to eat. 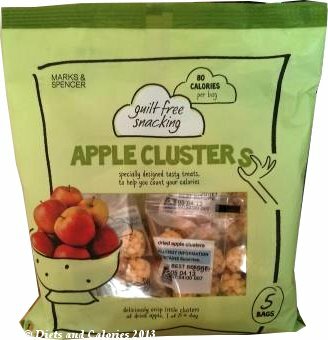 Their sweet apple flavour and crisp and crunchy texture is so much nicer than the chewy consistency of regular dried apple pieces. All the Guilt Free Snacking range are carefully portioned so that, even when a snack isn’t particularly healthy, you’re only eating a reasonable sized portion, which isn’t likely to add any extra weight. Each pack contributes to one of your 5 a day and has been given the M&S ‘Eat Well’ symbol. This means it’s a healthier option, best enjoyed as part of a healthy lifestyle that includes a balanced diet and exercise. Nutritionally, they’re great. High in fibre, but low in fat, saturates and salt. They do have a high sugar content, but this is provided by the natural sweetness from the apple. Available in Marks & Spencer food stores. Nutrition Information per 20g bag: 80 calories, 0.2g protein, 18.2g carbohydrate, 14.6g sugars, <0.1g fat, <0.1g saturates, 2.0g fibre, <0.1g salt.